experience, which is further enhanced by a cozy restaurant on the terrace and a wellness center with spa services (tepidarium, caldarium, frigidarium, whirlpool). Ideal for young couples looking for a romantic and relaxing holiday. 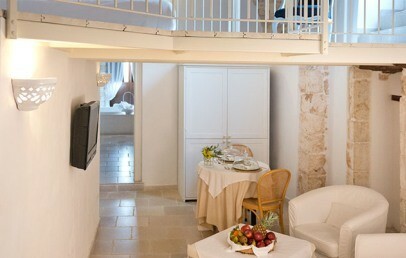 The Relais Corte Altavilla is located in the historic centre of Conversano, right in the heart of Apulia. 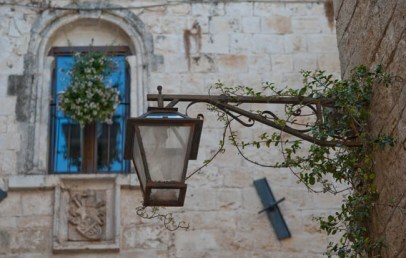 Conversano is about 30 km to the south of Bari and 40 km. It is approx. 210 m above the sea level and about 8 km away from the nearest beach. 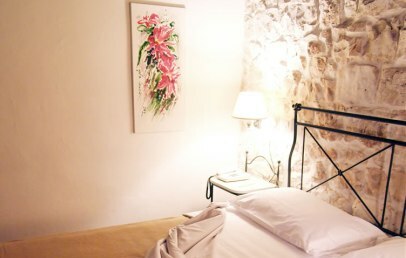 Corte Altavilla Relais is made of very peculiar flats: the building dates back to the Norman age and the hotel is surrounded by medieval walls, which used to hide the apartments of the Norman court. 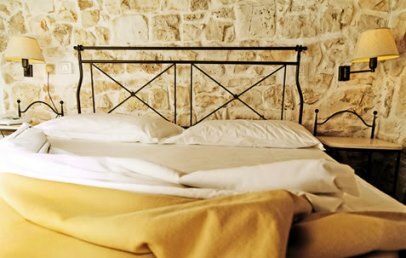 Corte Altavilla Relais is so charming because of the rich history of Conversano and especially thanks to the great modern comfort of its rooms. The hotel has 31 independent flats, each equipped with: air conditioning, sat-TV, safety box, ensuite bathroom with shower and mini-fridge. 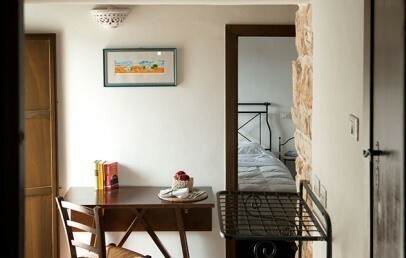 Some rooms have a kitchenette (on request, to be confirmed) with a supplement of € 30 per stay, to be paid on-site. Standard – are double rooms. These have been created in the same spaces, where once was a medieval court of the year 1300. 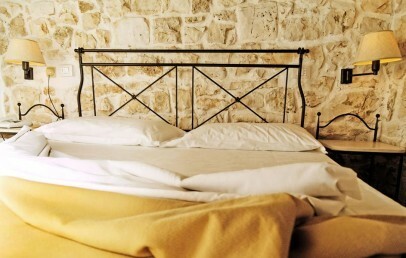 These rooms are equipped with hand-made iron beds and wooden furniture. Top Standard – are larger than standard rooms. 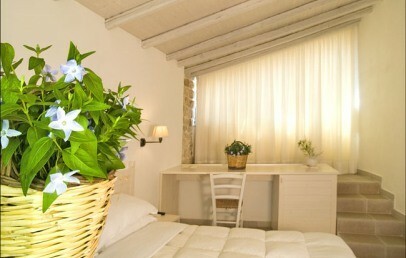 They can accommodate up to 3 persons in a double bed and a single bed in two separate rooms. Junior Suite – offer very comfortable bedrooms with a double bed, a living room and a very romantic view of the cathedral. Top Junior Suite – are more spacious than Junior Suites and also provide a welcoming living room and a Jacuzzi. 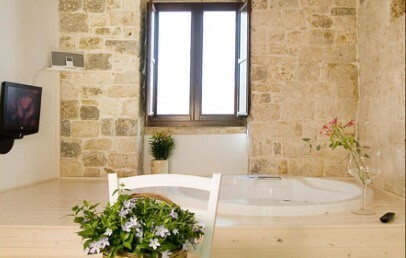 Corte Altavilla Relais disposes of a comfortable Thermarium Spa housed in ancient stone. Here guests can take care of their body and free their mind, through a path that includes several purifying and relaxing stages. The wellness experts take care of their guests with wisdom and competence, offering true relaxing moments. 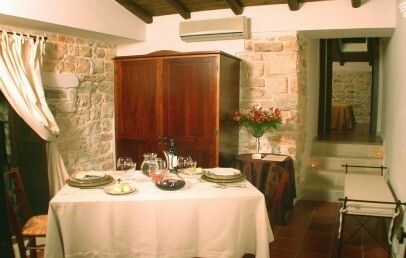 The restaurant Goffredo Ristorante osteria in terrazza offers traditional Apulian recipes. The menu changes every day, and only fresh seasonal ingredients are used, as well as a major part are at Km zero and biological. Lunch and dinner can be booked at the reception. The restaurant is right on the top terrace and offers a great view to customers, while they taste delicious Mediterranean dishes. The restaurant is open for dinner from Monday to Saturday and for lunch only on Sundays. Wireless hall, free internet point, lounge room with reading corner and courtesy bar are at guests disposal as well as complimentary Wi-Fi connection all over the hotel. Further guests can make a different experience, taking part of a fantastic cooking class organized by Corte Altavilla Relais in a beautiful farm, headquarters of an culinary association and hotel partner or discover the beautiful nature around the hotel, by booking an excursion with the hotel boat or renting a bike. A Soccer court is available in the nearby. A public parking is available 200 meters away from the hotel and a private parking is at 1,5 km. The hotel offers a complimentary shuttle service to/from the parking (to request at the reception). 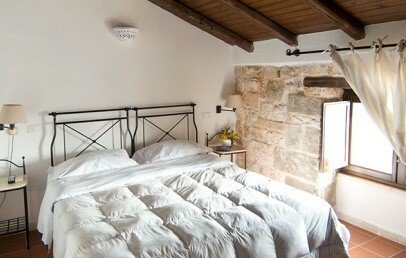 Double Rooms with stone walls and white plaster, they are tastefully decorated. All of them have wrought-iron beds, wooden furniture and a bathroom with shower. They are all located inside the Medieval Court of 1300. 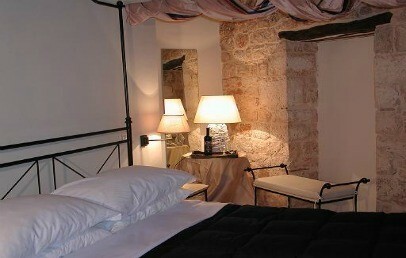 Double room with an elegant contrast between the walls of white stone, the plaster and wooden beams. 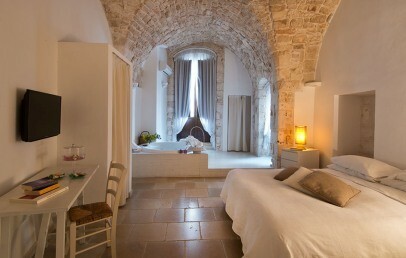 It has a stunning view of the Romanesque Cathedral and has a cozy sitting area. Spacious rooms with three beds in two separate rooms. 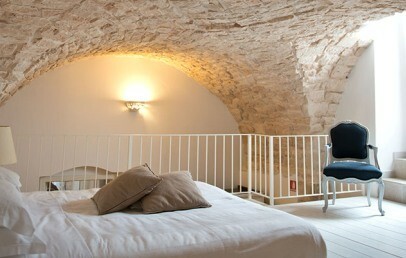 The beds and dormeuse are in wrought iron and the decor is characterized by vaults, wooden beams and stone walls. They are furnished with style plus a cupboard that contains a kitchenette and a refrigerator. The dominant white of the stone, plaster, beams and the relaxing, circular jacuzzi are the features of our top junior suite with two beds. They are all furnished in a charming style. Wide suite with two bedrooms and two bathrooms with a large jacuzzi. The charming furniture, the dominant white of the stone, plaster and beams makes it luxurious and engaging. It has a private terrace. The apartments consist of two bedrooms and a living room with a small kitchenette. The bathroom has a shower. 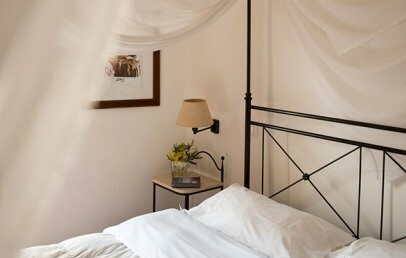 The furnishings are on wrought iron, they have large windows, spacious rooms and offer modern comforts. 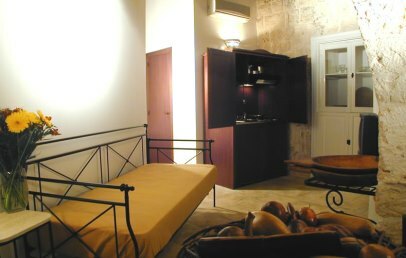 The apartments have air conditioning, minibar, kitchenette, satellite TV, complimentary Wi-Fi connection, safety-box. In some of the rooms is available a kitchenette. Upon availability and to be confirmed by the hotel. € 30 per stay to be paid on spot.